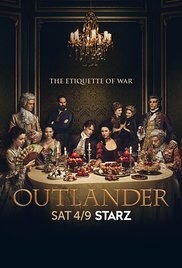 Outlander, Season 2 (♦♦♦♦): After Jamie is tortured in Wentworth Prison at the end of Season 1, Murtaugh, Jamie, and Claire embark on a trip to France to heal, and, if possible, to thwart Prince Charles Stuart's rebellion from the start. A lot of political maneuvers and counter-maneuvers will be necessary, however, because Charles Stuart, while in need of funds to raise an army, will keep his trump cards close to his chest. Eventually, the action moves back to Scotland, where the Jacobite uprising will face outside challenges as well as some from within, such as lack of food, and a divided hierarchy. Lavish houses, manicured lawns, the excess and glamour of King Louis XV court, together with sumptuous costume designs and jewels, and new supporting characters that compare in depth to the ones we already know, make the first seven episodes of Season 2 a feast for the eyes. Even the cover soundtrack has gotten a makeover, with one portion of the Skye Boat song sung in French to suit the setting. As the characters move back to Scotland, the rhythm of drums, pipes, and accordions punctuate the action scenes during the advance of the troops and battles. There are three villains in Season 2: the delightfully devious Comte St. Germain, the Duke of Sandringham—who plays a bigger role than in season 1—, and the grotesquely perverse Captain Jonathan Wolverton "Black Jack" Randall. There is also a hotheaded wild card in the character of Dougal McKenzie. All of them provide much needed counterbalance to the always-ready-to-kiss pair of Claire and Jamie, and make for very dramatic moments this season. Fences (♦♦♦½): Troy Maxson (Denzel Washington) makes his living as a garbage collector in 1950s, Pittsburgh. He is 53 years old, and is married to Rose (Viola Davis). Life has dealt more than its fair share of blows to Troy. In middle age, as a baseball player, he saw his talent go to waste because of his race, and he determined not to allow his son Cory to repeat the same mistakes that marred his life. Fences, acted, directed and partly produced by Denzel Washington, is an adaptation of the August Wilson's Pulitzer Prize-winning play. It is a powerful movie about a larger than life ordinary man who feels cheated of great opportunities, and rules his life and the people in it with a scorching iron hand. It is not easy to live with the man, be his wife or his son, but he never wavers in his responsibility as breadwinner and man of the family. Troy Maxson—played exceptionally by Denzel Washington in his most powerful performance ever and for which he should have won the Oscar for Best Actor in a Leading Role in 2016 above Casey Affleck— spends almost the entirety of the movie relating stories about his upbringing and his life journey, and as the final credits roll, we as the audience feel the void left by the character. Rose, Troy's wife, is a complete opposite. She bears the heat of her husband's overwhelming persona with quiet, yet striking aplomb. Surprisingly, despite Viola Davis giving a powerhouse performance in Fences for which she won an Oscar for Best Actress in a Supporting Role, hers is not the character that stays with you as the movie ends and makes you want to watch it again, that accomplishment is Denzel's alone. Silence (♦♦♦): Two Portuguese Jesuits travel to Japan in 1660 to spread the Christian faith, and know the whereabouts of a prior missionary who is rumored of having apostasied and taken a Japanese wife under duress. Directed, and produced and written in part by Martin Scorsese, Silence can boast of having outstanding cinematography and great actors in the leading (Andrew Garfield) and supporting roles (Adam Driver, Ciarán Hinds, and Liam Neeson). The sound effects are noteworthy as well—sea waves, flies in flight, raindrops, and other nature sounds, instead of a musical score, give this story an elemental quality. Silence will undoubtedly appeal to the Christian faithful more than to believers of other faiths, and perhaps as a curiosity it will appeal to movies aficionados as well, but I found it unnecessarily long, and with a dry narrative. I did watch the first Outlander series and enjoyed it very much so I should get around to this one short. I've been catching up with other series - well, more like starting ones that everyone has loved for years but I haven't got round to watching, for example Downton Abbey - which I watched the entire thing in just a few weeks, And, now, Game of Thrones where I'm up to season 4. I understand. I am up to date with GOT, but I want to start over before the end of Season 7, which is about to start, because I feel there's so much I don't remember already. I, too, missed Downton Abbey and will join Netflix soon to start watching it. I also want to watch House of Cards, Empire, Sherlock, Breaking Bad, and Luther, and that's juggling the shows I'm already watching. Who would have thought? I didn't watch TV for so many years, and now I don't want to miss all those wonderful shows out there, though in truth, I still don't watch TV; I just stream the shows I want to see. Anyways, enough with the babbling...If you liked Season 1, you'll love Season 2 because it is even better. I've only just managed to get caught up with Season 1 of Outlander, but am looking forward to watching Season 2. The book it's based on is my favourite of the series. In Season 2 producers outdid themselves: locales, costume designs, plot...the works. It is even better than both parts of Season 1 and that is saying something. Season 3 is about to start this summer. Can't wait! My daughters are both big fans of Outlander and got me to watch a bit of it, but I just couldn't get into it for some reason. Maybe I didn't give it enough of a chance. I'm hoping to watch Fences at some point. I do love both Denzel Washington and Viola Davis and would watch them in anything. Give Outlander a chance and you may very well like it. Don't miss Fences! It is not an easy watch, but the powerhouse performances of Denzel and Viola make it worthwhile. Outlander Season 2 was SOOO good. I can't wait for the next season coming later this year. I really enjoyed Silence, though there were a few shots that looked a bit odd. Overall though I was struck by the dramatic imagery and, as you mentioned, the sound effects. Yes, Kate, Season 2 was outstanding. I can't wait for the new season either. I understand why you found Silence appealing. The cinematography was striking. I just couldn't click with it on an emotional level. I saw Fences in the theater with my best friend. It was so moving and Denzel was amazing. I have Silence in my Netflix queue. Sounds challenging. I agree on Fences. I don't know what to tell you about Silence, except that it is very long. It wasn't my kind of movie but it may work for you. Who knows? I hope you enjoy it. Both parts of the first season are really good, but I think you'll love Season 2 when you get to it. I always meant to see Fences but I never did. I will have to! I like Denzel and Viola but I wasn't sure about seeing a play turned into a movie but it does sound worth it. Not sure I can sit through the whole Silence, might be too long for me. I highly recommend Fences. Whether you like it or not has more to do with personal taste. The movie is done well, and the only way you would recognize the source material as a play is in the long monologues. I don't recommend Silence. It is visually striking, but the cinematography and the performances don't justify its length. I loved Fences, although I thought Viola Davis was the star of the show even more than Denzel. My only issue was that even on screen it felt more like a play than a movie. I liked Denzel more, but I'm biased. You are right; the movie felt like a play.